One would think that I seek out bad restaurants intentionally as of late... with my current track record. However, I think it's just the nature of the industry: some nights you got it, some nights - well.... you don't. I hit another not-so-terrific-restaurant-despite-other-raves. Again. So my latest venture to Almond (NYC) was anything but scrumptious or worth writing about. However, I have this blog and I'm supposed to say something.... Momma always said, "If you can't say something nice...." Well.... I can say that the decor was nicely done for the space that they had available. There. I said something nice. Those 10 minutes for the table, came and went. My friend's husband went back to the hostess after we were sitting at the bar for over 30 minutes... WELL past the reservation time. We were finally seated and all of us ordered something different - but I really and truly felt like this "Warm Salad of Duck Confit & Frisee poached egg, butternut squash, sherry vinaigrette, ricotta salata" spoke to me. I wish it would have yelled loudly at me NOT TO ORDER it. Salty, soggy and with an overcooked egg.... a delight, it was not. The service was friendly, when it was available. We literally sat there for hours. Not that we didn't enjoy the atmosphere and being with our friends. We just would have liked our drinks refreshed and our meal ordered before sitting in the restaurant for hours on end. 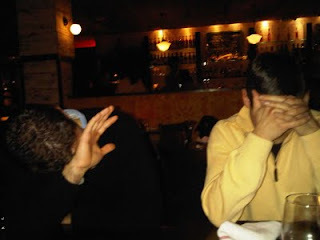 Even when we were ready for the check, the waitstaff was incognito... still. You'd think they'd want the money and the tips. That's what logic speaks, but here....Maybe not. Hopefully, the waiter and bus boy were not in the kitchen cooking. But, come to think of it, it may have helped. Or, it could have explained a lot since the people in the kitchen obviously had no clue what they were doing or how good food should be prepared. My teenage children cook a LOT better than this place. I should have asked them to whip up something with me in the kitchen that night... instead, I just learned that in order to enjoy Almond, one must drink heavily and/or just be nuts. Save Your Sacred Money and Avoid This Vegan Disaster! I am a big fan of eating healthy, so when my good friend suggested that we go to Sacred Chow, I was all for it! My friend, Rebecca, is not only a vegetarian, but she also has a strict kosher diet. A place like Sacred Chow is perfect for her -and she's been on many occasions. However, the night I went with her, it was anything BUT a good night at this locale. To start off, when we entered the establishment, we were seated at THE smallest table in the restaurant -in spite of other openings - AND a request for a better space, we were denied. We sat close to the door -and it wasn't a warm breeze coming in, either. The coldness of the waitress superseded any of the environmental conditions outdoors, however. She continued to be miserable. We had to wait for water, napkins and any culinary basics. By the time we ordered, we had already been seated at the minuscule mini-shoebox for a table for well over 20 minutes. The waitress was annoyed that I asked questions about some of the dishes and didn't even look at my friend, Rebecca while she ordered her typical fare. Again, Rebecca had been there before and LIKED going to Sacred Chow. We received our dishes ice cold and with NO seasoning what-so-EVER. I've had vegan food - and it can be scrumptious. 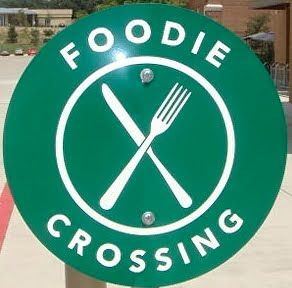 I don't even KNOW what this place attempted to call food - but edible, it was not. Another friend of mine recently commented that "Sacred Chow is not fit for human consumption..." and I ignored her warning - thinking she was there on an "off" night. (Every restaurant has 'em!) But no.... no, she was spot-on. This was a terrible meal. Terrible space. HORRIFIC service. 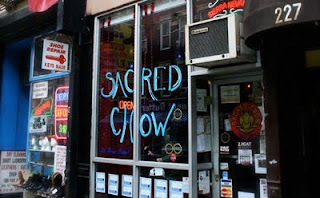 I would NOT recommend Sacred Chow to ANYONE in the NY area - or to tourists looking for a vegan experience. I wouldn't even want your DOG to have any of the leftovers there - they might have gastrointestinal distress that is way beyond comprehension. Bad meal. Bad bad bad. Sacred Chow is not worth the sacrifice. There's not a star in the universe that would twinkle for this nightmare. Save yourself for real, good, vegan cuisine. Try Peacefood Cafe - I'll write about this gem in an coming blog soon....!